The distinctive experiences at Evolve Back are made possible by an eclectic, amiable and knowledgeable group of people who come from different walks of life. In keeping with our ‘Think Global – Hire Local’ policy, many of them are from our immediate neighbourhoods, and have over the years, evolved to become a valuable part of our family. Trained and constantly mentored by experts who represent the best from the fields of hospitality to wildlife conservation, our people endeavor to deliver truly life-changing experiences to each of our guests. When you are taking one of our exciting boat safaris up the Kabini, eagerly anticipating the sighting of an elephant family, a basking crocodile or a painted stork swoop down upon a hapless fish, someone will point all these and more animals out to you long before you see them, even if you are sporting your most powerful binoculars. Our boat driver, Sivaraj, is a very unassuming man thinking no more of his outstanding sight as you may of your ability to drink a glass of water. He is a gifted pilot and navigator, intuitively steering us away from the submerged trees that stand petrified below the surface of the river like hidden sentinels waiting to ambush passing boats. This ability too he takes lightly, as you may your ability to read a wildlife encyclopedia. 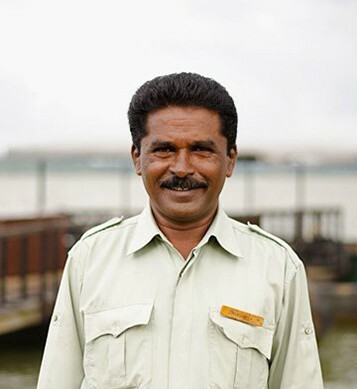 Sivaraj hails from the village closest to our resort and is truly a man of many parts. He is an expert radio and television mechanic, a heavy vehicles driver and a knowledgeable farmer. As a youth he spent a few years in the port town of Mangalore piloting and maintaining a fishing boat. On his return to his village he started a television repair and spare parts shop that he ran successfully until a few years ago when falling TV prices forced people to think in terms of replacement over repair. When he heard that we were organizing boat safaris and needed a driver he was happy to sign up. He has taken to his work like a duck would take to water, to use an old but apt metaphor in our opinion. He is, after all, our boatman from the village next door. Let him cruise you up and down the beckoning Kabini and sharp shoot for you with his eyes. It’s an experience you will bookmark for a long time to come. Sarath has been a wildlife enthusiast for the past 24 years. Having grown up reading Jim Corbett’s stories, his tryst with wildlife was sparked off by a trip to the Jim Corbett National Park, way back in 1983. Sarath is a post-graduate in Sociology from the prestigious Delhi School of Economics by qualification. As a student, he traveled across the length and breadth of India, on all means of transport, including the bicycle, motorcycle, local buses and trains to quench his thirst for learning more about wildlife. After dabbling in many professions including being a stockbroker, his opportunity to be a full-time naturalist came, when the Taj Group of Hotels appointed him as the Chief Naturalist for a wildlife resort in Nagarhole in 1996. Later, he was the Chief Naturalist for Jungle Lodges and Resorts (JLR), a pioneer in ecotourism in India for 7 years, initially based in their world renowned, Kabini River Lodge at Nagarhole. Sarath has a rich experience in guiding tourists and has led many prestigious wildlife groups, such as those from the Harvard Museum of Natural History, the Smithsonian Institute and so on. He has also assisted many international researchers and filmmakers in the field. He has spearheaded the Training and Consultancy wing of JLR. Additionally, he has worked closely with the Karnataka Forest Dept in various field programs including wildlife census operations, training of forest guards and wild elephant capturing operations. His special interest has been to work closely with local communities. He is the Founder-President of the Kabini Foundation, an NGO working for wildlife conservation through the local community, in the Kabini region of South Nagarhole. 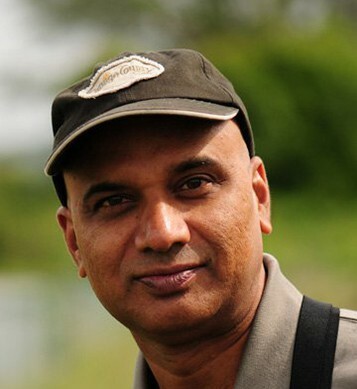 Apart from being a high caliber naturalist, Sarath is also an accomplished photographer and writer of wildlife tales. His blog sitewww.sarathcr.blogspot.com is a treat for naturalists, full of captivating pictures, engaging anecdotes and informative notes from the wild. In his wildlife travels around the world including India, Nepal, Sri Lanka, Madagascar, Ethiopia, Canada, Sumatra, Borneo, East and Southern Africa, Sarath has had close encounters with some rare species in their natural habitat, including Mountain Gorillas in Rwanda, Snow Leopards in Hemis, Orangutans in Borneo and the Ethiopian Wolf. He is also an ardent trekker and mountaineer, having trekked across the Namdapha National Park for over fifteen days and reaching the summit of Kilimanjaro in August 2005. Sarath joined the CC Africa-Taj joint venture, Taj Safaris in January 2006 as Chief Naturalist and Head Trainer and participated in the 6 week Inkwazi training course in Phinda, South Africa. He was pivotal in setting up and running an intensive in-house training programme for their operations in India, training over 30 naturalists who provided an unmatched and world-class interpretative safari experience for their guests. Sarath is a frequent speaker at seminars and workshops on wildlife and ecotourism. He is also a founder member of India’s first ecotourism society, the Madhya Pradesh Ecotourism Development Board and the Madhya Pradesh Tiger Foundation. He has also contributed many articles and authored the book, ‘Guidebook to Nagarhole and Bandipur National Parks’, published by Macmillan books. Orange County is proud to have Sarath join us as Associate Director – Conservation, to take our conservation initiatives and interpretative safari experiences to world-class levels.